Group Spanish Classes for Families . . .
We especially welcome families who want to combine Spanish classes with other activities that explore the culture, history and stunning environments of Ecuador. Parents can study along with their children if their Spanish levels are similar, or adults and children can study separately. We can provide teachers to travel with a family around Ecuador on any of our set "Study and Travel" programs, or you can design your own Study and Travel program that can include visiting any of the indigenous communities that our foundation works with. We can arrange classes at either of our schools - in Quito or in Cuenca - along with accommodation with local host families or in hostels or hotels and extra activities that will round out the educational experience of visiting Ecuador. 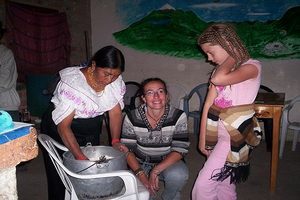 And if you would like to volunteer as a family our volunteer couselors and coordinators will be happy to discuss the options with you and to help you set up a suitable volunteer experience as a family, either in Quito or Cuenca, or on any of the over 35 projects that we are partnered with around the country. "I was so pleased that we got to give our children exactly the experience I was hoping we could offer them. Remembering my days in the Peace Corps I was thrilled to be able to visit places that were authentic and far from the usual "touristy" fare."